John Trengove’s feature début is an adaptation of Thando Mgqolozana’s novel A Man Who is Not a Man, which explores the enduring taboo of homosexuality in South Africa’s tribal communities. 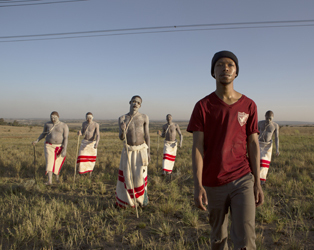 The story hinges on the experiences of Kwanda (Niza Jay Ncoyini), a cosseted Johannesburg teenager who is preparing for Ulwaluko, a Xhosa rite of passage that begins with ritual circumcision and continues thereafter as the young men heal in isolation. Though Trengove roots his drama in the specifics of the indigenous community, his focus on the fragility of masculine constructs has universal relevance.